I'll only address the long arm machine. Yes, I think the market is flooded with long arms, and there are many out there in competition if you are trying to quilt commercially. It is wonderful for personal use, and knowing you won't wait in line to get something done, OR that it won't be just how you envision it. But working a diagonal SL design that it your Go-To is harder on the long arm than a sit down domestic, IMO. You either need to use channel locks or rulers, and that diagonal on a large quilt is still something I don't think I'd ever do. Quilts load on the vertical or horizontal axis, and there is only so much quilting space available at a time. I would be doing exactly the same as you if the same kind of quilting was desired on a piece of work. Turning back to my domestic, and SLQ with a walking foot, with my longarm taking up all that space behind me. This is beautiful, and beautifully done, Jayne. I just love the square with the rectangle. I remember when I started quilting how amazing I thought long arm machines were!! It was so new to me! I’m sure the majority of people do purchase so they can offer a service, I’m just blown away at the sheer number out there! I will be sticking with my domestic machine and leave long arm quilting to those who have a talent for that! And every once in a while I’ll send one out for that special added touch!! Thank you Julie for educating me on some of the ins & outs of these machines and the process. I’ll admit I don’t know a lot about them! Miss Rosie does minis with several layout options. Titch is on my list to do. I say go for it! As long as the block pattern construction is the same, varying sizes or layouts in the same pattern is great. Gives more options to the sewist. I know different sizes is important for patterns, I wasn’t sure how different layouts were handled or block sizes! More to think about!! In my area, there is a shop that rents time on long arms, which makes it more affordable. That might be an option for you on occasion? My mom bought a simple, affordable long arm many years ago and I'm fortunate to be able to quilt on it. I love this baby quilt! so awesome. And I think different layouts for different sizes in one pattern would be totally fine! I really like your little quilt. I love straight line quilting. At my age (65) by the time I conquered the machine I’d be too darn old to use it. Several different layouts would be a great idea. Multiple layouts would make a great pattern. Currently patterns with multiple sizes use bigger block sizes or are more blocks of the same size for the other sizes. 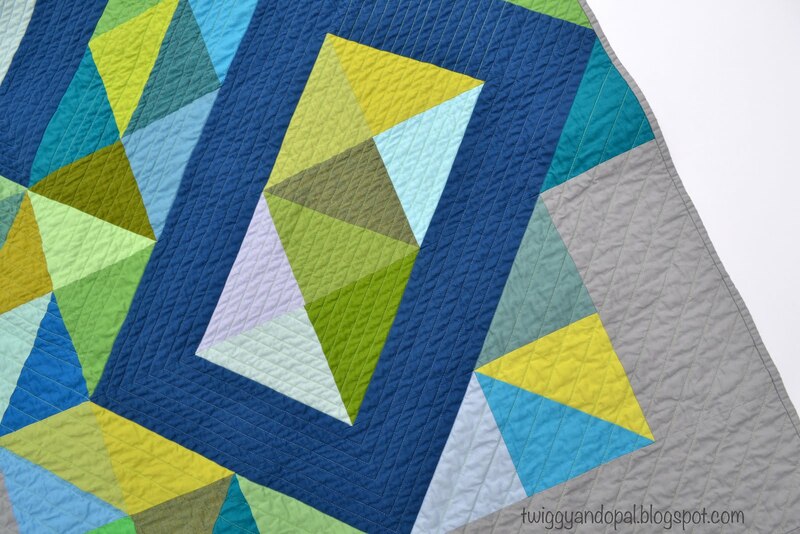 Have the increased or decreased size be related to the block layout would be a great way to help people understand more about quilt design which is a huge bonus and encourage quilters to experiment more with other quilts they make! Win, Win Win! I think different layouts would be a benefit in a pattern-more bang for your buck. I have seen a quilt and a table runner in the same pattern but with different layouts. 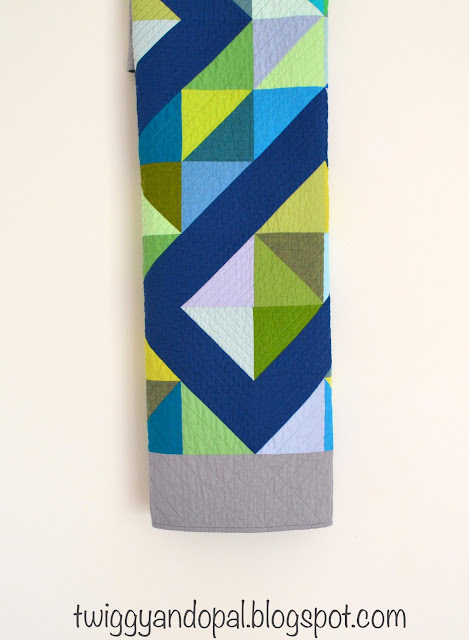 Love this quilt:) You could always get a smaller longarm(short or midarm they are called). Wouldn't take up much room, cost less, is lighter weight to move around. 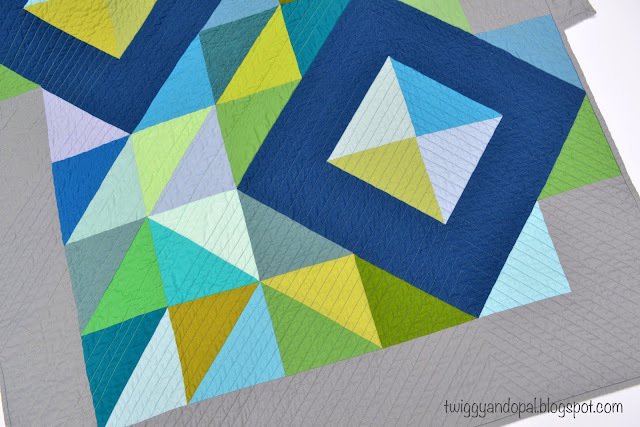 But like Julie said not so good for the diagonal quilting, but great for free motion or ruler work going horizontal. Absolutely gorgeous. You've started the ball rolling in my head on a different way to lay out HSTs. I've got boxes of these things laying around from quilts I've made in the past. Very cool and I love your colors and ALL that texture. Love it! 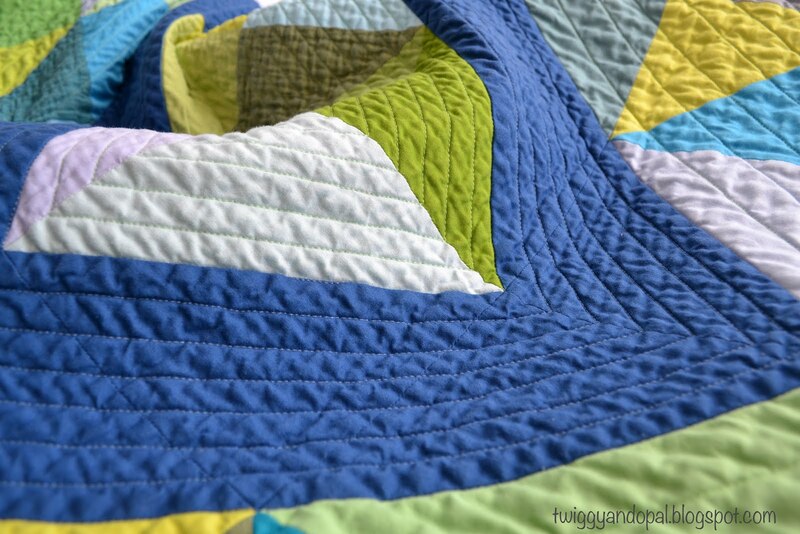 Gorgeous quilt, I love the modern look, the quilting, the colors. You did a fantastic quilt Jayne! I love how you play with color and it all looks so wonderful! 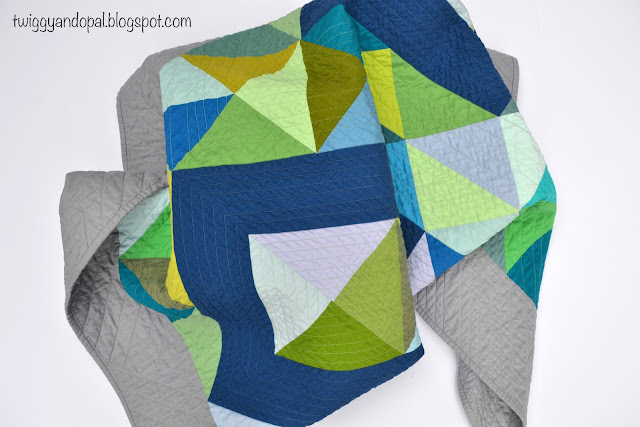 I've been building up my stash of solids, but still see colors in your quilt that I need to get some of! I love this. The blue makes everything pop. I love this one and can't wait to see the one the scraps came from. A pattern with different sizes including different layouts would be awesome! I think it is awesome you finished the scrap quilt before you finished the original. I know that is how I usually do it. I have to say that as much as I would love to veer my quilting skills to something else, there is nothing quite as satisfying as good old straight lines to me! I’ve already moved on from these colors and scraps to another project…which oddly enough has produced ‘scraps’! Stay tuned is all I can say!! I love those little bits that stick out into the border...and of course my favourite colours as well. 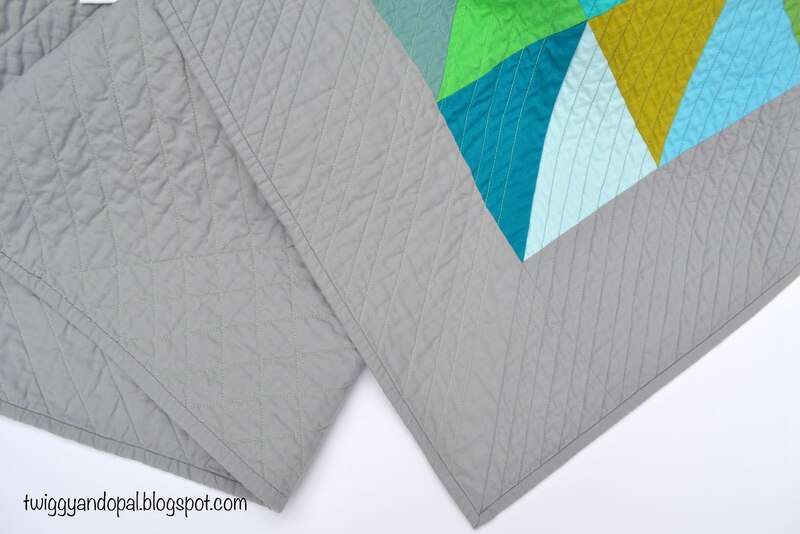 The texture on your quilt is absolutely drool-worthy! Quilting a top and seeing the texture develop is one of my very favorite things. I have electromagnetic channel locks on my longarm which lock the machine in place at the flip of a switch. The locks were an add-on but to me they are worth every penny they cost, as I love to do SLQ. You are right in that there are so many people with LA machines now. There are some very affordable machines on the market. You just have to do a cost analysis - how many quilts do you make in a year and how much time do you spend quilting them. Everyone has a different break even point, so what works for me may be different for you. You do amazing work on your domestic. Have you considered a sit-down machine, like the Tiara or Sweet Sixteen? That's what I started with and I still love it! I've seen other patterns that have different layouts for different sizes for just the reasons you've mentioned. I like seeing the options of putting the quilt together. It's like log-cabin quilts where you have so many different layouts for just the one block. Love that. What a great design and colors. Really like how you quilted it, too. 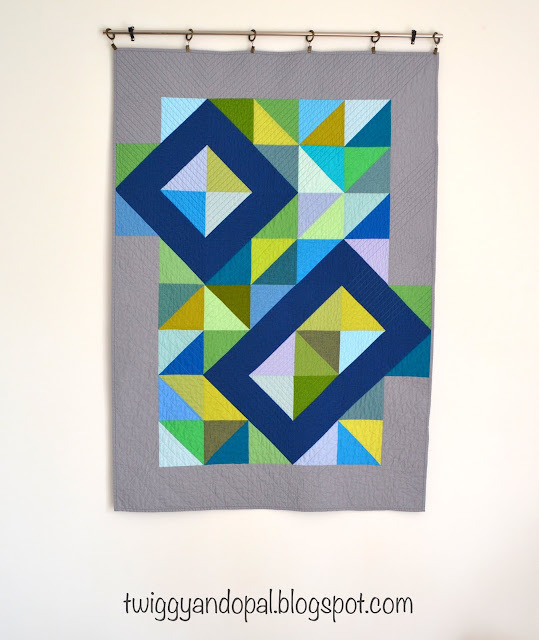 Oh Jayne, every quilt of yours has oodles of OOMPH. Makes me think that it may be not the quilt but the maker with the oomph :-) Flattery aside, it is a lovely quilt. Simple HSTs elevated by your clever placement and the oomph!!! You were featured on NTT! Good for you! I am not sure how I missed this post, but I did until I saw it there. This one is gorgeous! Now I can't wait to see the original! I love the quilt. It is absolutely modern and unique. 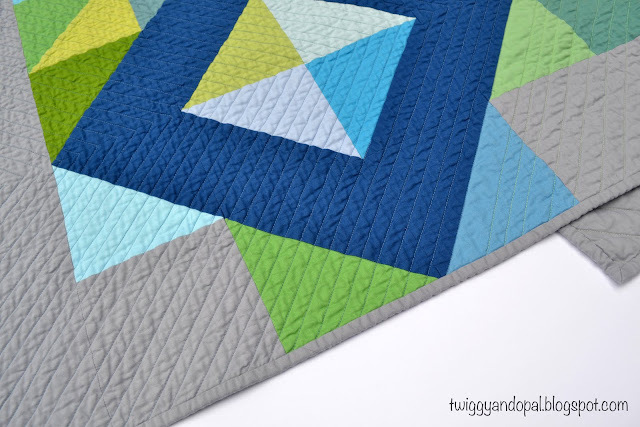 I like patterns that offer several sizes, but have not seen any with differing size blocks per the size quilt. That could be useful to people, though.